Group photo for the Daily Mail 1950 swim. 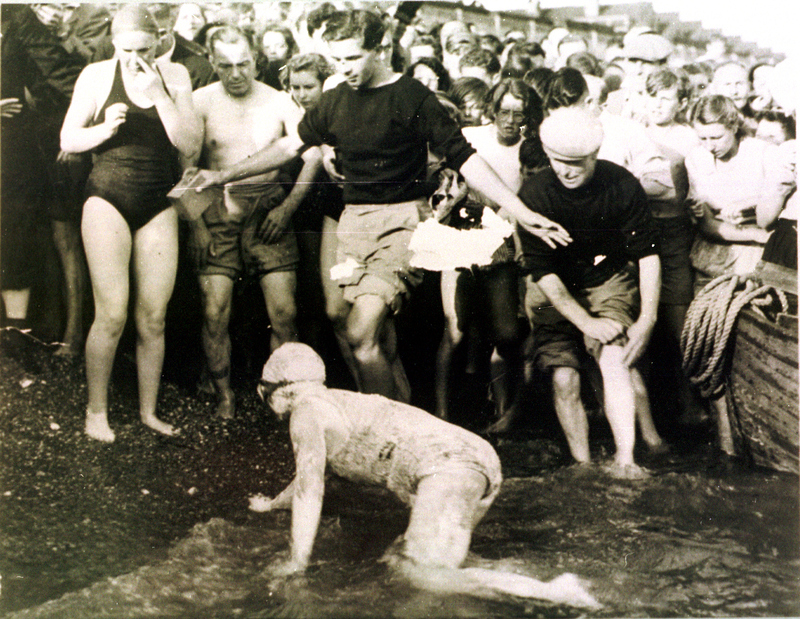 Eileen Fenton, 1950 Daily Mail Channel Swimming Race. Shakespere Beach. 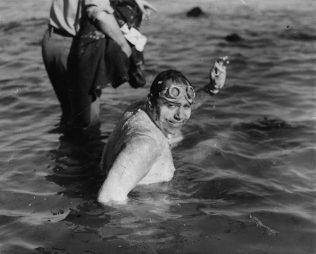 The race organiser was Ted Temme, Channel Swimmer and winner of the Dover Gold Cup. Temme was the first man to swim across the English Channel both ways, from France to England on 5 August 1927 and from England to France on 18 August 1934. 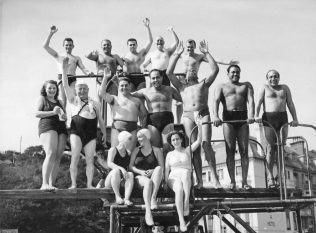 He was also a water polo player who competed in the 1928 Summer Olympics in Amsterdam and the 1936 Summer Olympics in Berlin. 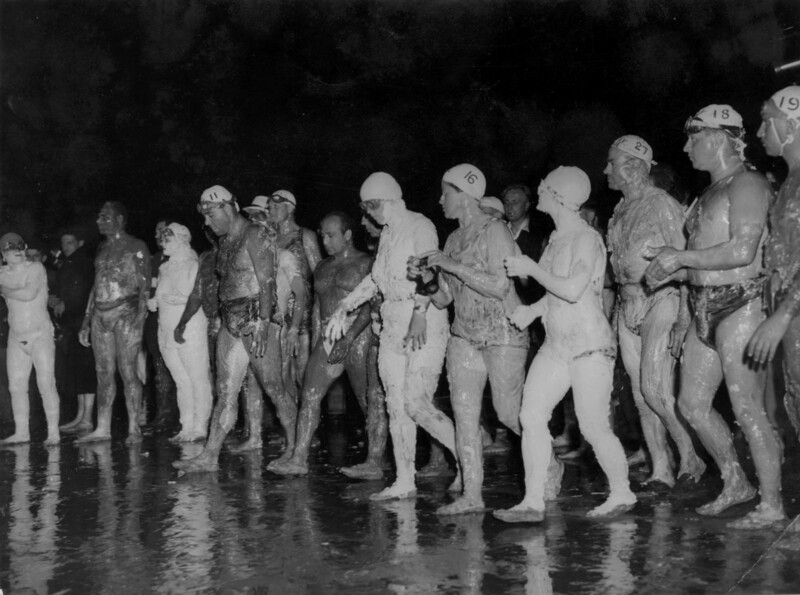 Seven men and two women, out of 24 contestants, staggered ashore along six miles of Dover coast on August 23rd 1950 after the first mass cross-Channel race in history. The winner was a 17-stone Egyptian, Hassan Abd el Rahim, 42, whose time of 10 hours 52 minutes broke the record by 13 minutes. He beat a Frenchman, Roger Le Morvan, by 10 minutes. Le Morvan led until the last hour. 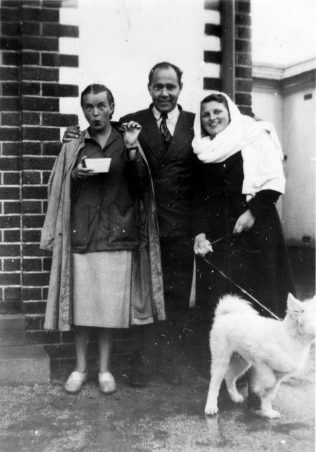 The first woman to finish was a 21-year-old English Scripture teacher, Eileen Fenton, in 15 hours 27 minutes. 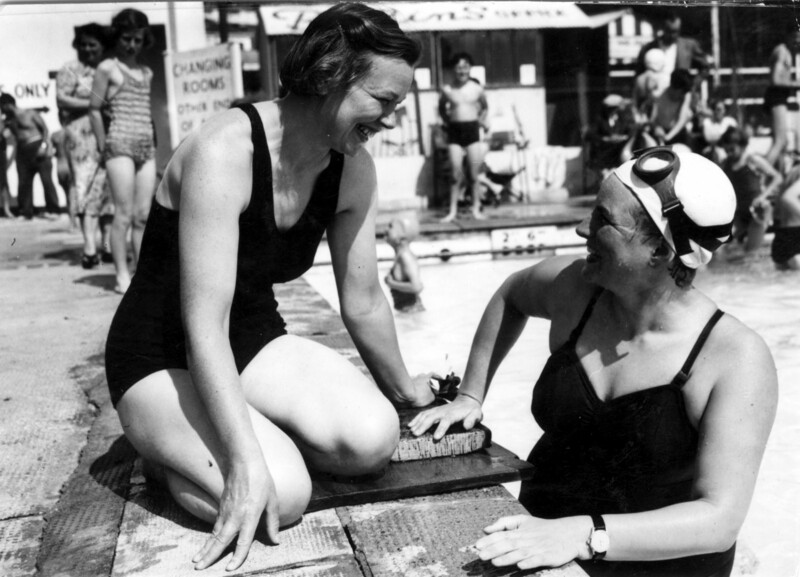 The “Daily Mail” paid £1000 each to Rahim and Miss Fenton, and £250 to each other successful swimmer. The swimmers were started from Cap Gris Nez early on the 23rd. Half-way across, the Greek swimmer Panagiotis Kameros was joined by a 15-foot shark. His seconds snatched him into their motor-boat as the shark raced in to attack, with three other sharks standing by. Miss Fenton crawled painfully up the beach at Shakespeare Cliff, and collapsed. 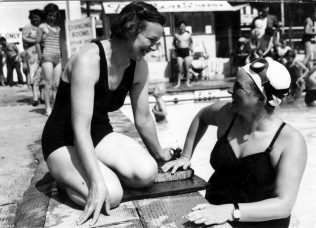 A strained shoulder muscle made her right arm useless at noon yesterday, and she swam the rest of the way on her side, using her left arm. 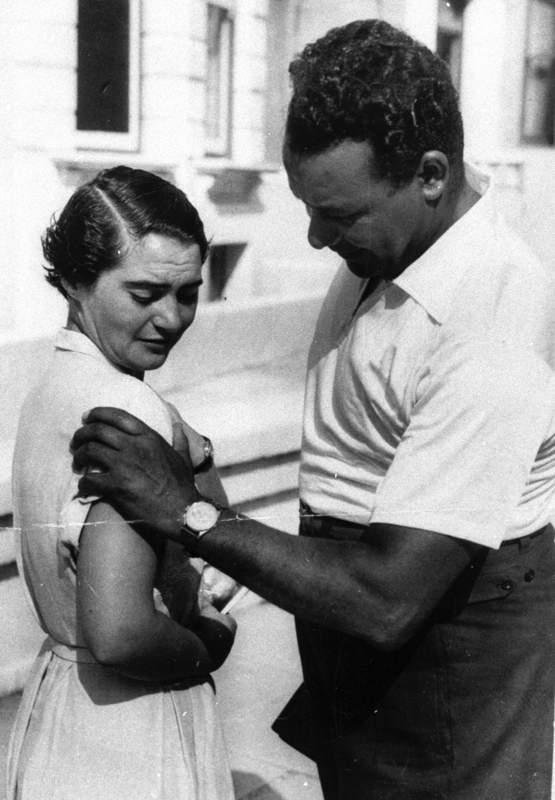 The last swimmer remaining in the competition, Egyptian Fahmy Atallah, 40, was taken from the water unconscious when only 300 yards from the shore. 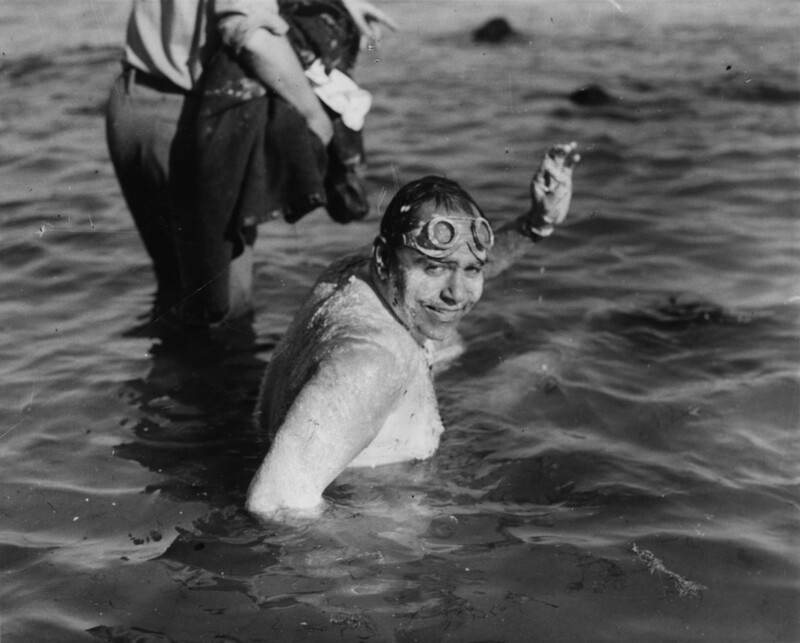 He had been swimming for 27 hours 13 minutes. DNF: Emile Soron (France), Eduard Mussche (Belgium), David Frank (USA), Willy van Rijsel (Holland), G.B. Brewster (Great Britain), Panagiotis Kamberous (Greece), Elna Andersen (Denmark), Margareth Ann Feather, Fahmmy Attallah (Egypt).